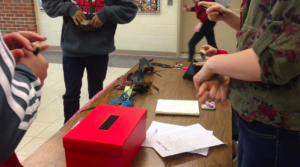 MASKS ON: Students purchase tickets and masks for the Masquerade Dance by the athletic entrance on Friday, February 23. The dance was held in the Jr. High gym and lasted from 8:30 to 11:00, and included dancing and a photo booth. “I thought the theme was creative but also unique because o f the masks we could wear ” said Jack Mccain , 11. On Saturday, February 24, West Lafayette’s VISTA put on their annual semi-formal winter dance. Students enjoyed an elaborate evening full of dancing and fellowship in the Jr. High gym. The theme was a masquerade and included sparkling red, black, and gold decorations and a photo booth where students could get a Polaroid picture with friends. Masks were optional, but many people hid their faces behind intricate masks for the night. VISTA members spent hours Friday after school setting up the gym, decorating, and eating pizza. Although many attended this dance, the Homecoming dance gets the most attendance and is scheduled for September of next year.